Looking for something to keep you warm through winter? 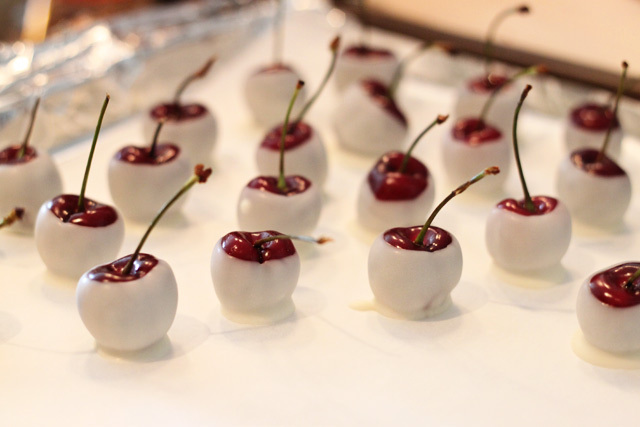 Here’s a deceptively impressive dessert that will wow the crowd: amaretto-soaked cherries, dipped in white chocolate. Keep the kids away from these! They’re flavorful, they’re not too sweet, and they pack quite a kick when you catch the amaretto liqeur. But the best part is that they’re super easy to make. Take your cherries (have them fresh-pitted, if you can) and make two or three small cuts into each one—you want them to absord as much of the amaretto as possible—and drop them into a mason jar. Then fill the jar (or jars, if you’re like me) to the top with amaretto. You could use a different liquor, too. I was first introduced to drunken cherries soaked in bourbon! Drop the jars into the fridge and leave them there at least overnight. I let my cherries soak for about 24 hours, but I wish I’d have soaked them longer. They’ll absorb more of the amaretto’s flavor and alcohol the longer they’re allowed to soak. Then all that’s left to do is dip! 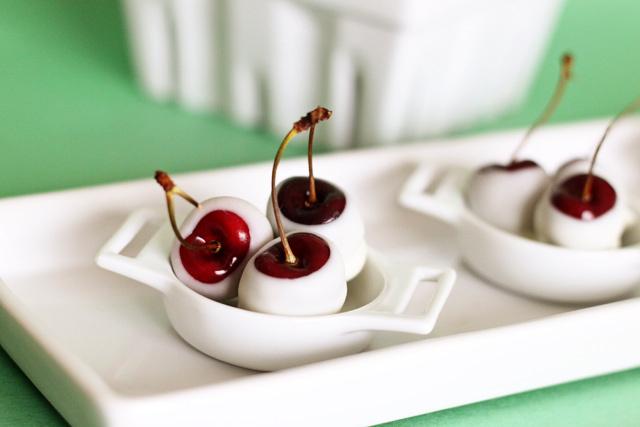 Melt down some white chocolate into a candy dip and, holding each cherry byt its stem, dip the cherries into the white chocolate. Make sure you eat the ones without stems and the ones that didn’t dip just right, you know… to make sure they’re not poisonous. Right? These guys would be a hit at any holiday party. Or New Year’s Eve party. Or maybe even Sunday brunch. Just make sure you have somewhere to leave cherry pits, if you don’t have them pitted. With a knife, make small ¼-inch cuts into each cherry. 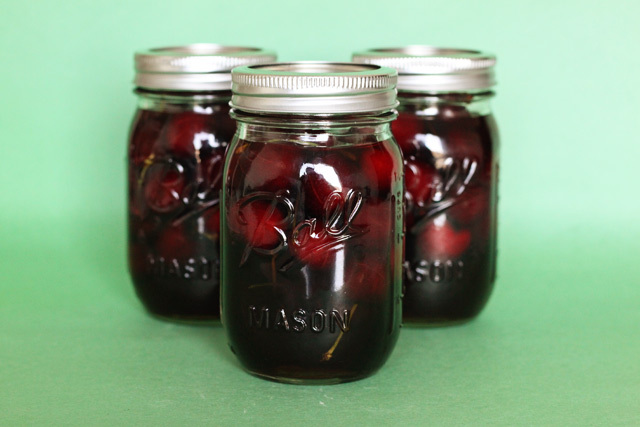 Place the cherries into mason jars, filling each jar about ¾ of the way full. Fill each jar with amaretto to just cover the cherries. Close each jar securely, and shake gently for 10 seconds before placing into the refrigerator. Let cherries soak for at last overnight, up to 48 hours. Melt some of the white chocolate chips in the microwave, adding vegetable oil as needed. Stir well to create a chocolate coating. 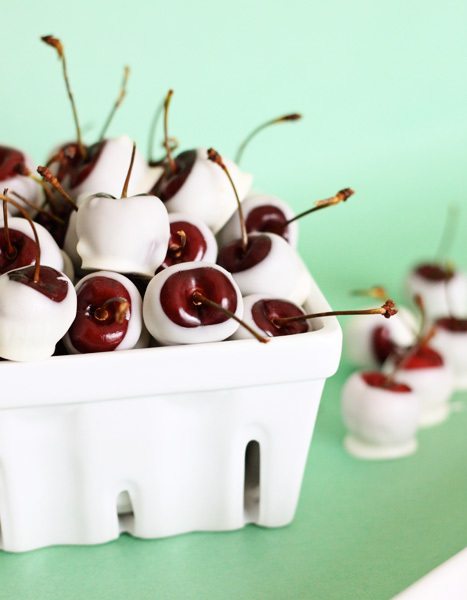 By its stem, dip each cherry into the white chocolate coating. Let excess chocolate drip off before placing the cherries on to a baking sheet lined with parchment paper. Refrigerate to set for at least 15 minutes before serving. Keeps best in the fridge for up to 1 day. Whoa. I’m not normally a cherry fan, but THIS is awesome! This is a really strange tip that somebody passed on to me once: Cut a small “X” shape in the bottom of the cherry with a sharp knife, then take a pair of clean (I used brand new ones) needlenose pliers and yank the pit out gently. It really works like a charm! I think cherries are so elegant with the stems still on. I wonder if this would go well with dark chocolate? Would one still need the vegetable oil? Oh I’m sure it would go wonderfully with dark chocolate. FYI, the vegetable oil is there only to thin out the melted chocolate and make it better for dipping. If you used chocolate candy coating or “dipping chocolate,” you wouldn’t need the oil at all. I would melt your dark chocolate and add the veggie oil until it’s thin enough to dip in. amazing, elegant and easy recipe, definitely will create buzz at any parties! thanks for sharing! yeah, how do you unpit the cherries and keep the stems on? A strange tip: Cut an “X” shape in the bottom of the cherry, then take a clean pair of needlenose pliers and yank the pit out gently. It works! I’m thinking Christmas and as perfect nibbles for Valentine’s Day! They look super-pretty! If I cannot find cherries at ANY store near me, would raspberries or strawberries be a good alternative? I’m worried that raspberries may fall apart. These look amazing! If they weren’t fantastic enough just soaked in Amaretto, you dipped them in white chocolate and kicked them up notches unknown. Ha! You crack me up! Thanks! I was wondering if you can reuse the amaretto afterwards? Re-use it? There will be none left. I’ll have drunk it all. There is going to be diminishing returns . . . Secocond batch won’t be as good. They look really beautiful! And you just use white chocolate? Nothing to thin it down? Thanks! I either use white melted candy coating straight from the bag, or white chocolate chips mixed with a tiny bit of vegetable oil–just enough to make it thin and dippable. Any ideas on how long the cherries could stay in the amaretto? We have wonderful cherry season in July-but if I wanted to do this another time of year, I wonder how long they would last? do they get soggy? Asking because I want to place them in a gourmet food gift box for christmas. These look amazing! What brand of Amaretto are you using? Would it be a bad idea to opt for something a bit cheaper than Di Sarrono? I too am wondering if there is a way to gift these via snail mail? Can you use marischino cherries? The fresh cherry season is so short. Just wondering if the maraschino cherries worked. These look so good cant wait to try them. Going to change it up a bit and use strawberries too. If you cut the X in the bottom to remove the pit, do you still need to make the small cuts to soak up the Amaretto? How long will the keep in fridge soaking in the amaretto? Do they need to be kept in fridge? I want to make some for Christmas gifts. As its the middle of December and freshly picked, big luscious, sweet, beautiful cherries are not in season (mores the pity), any suggestions on making these here at Christmas?